As a brand, Serta has been around for quite a while. They’ve selling air mattresses for years and have always tried to be at the front of the game with new innovations for their normal mattresses. With all the knowledge that they have from years of making and selling more normal mattresses, it only makes sense that they would bring their knowledge to the air mattress world as well. While there are many lines of conventional mattresses that are sold by Serta, there are only a couple of different lines of Serta’s air mattress business. While this might seem like a bad thing at first, you will find that each line of air mattresses does something a little bit different. While there are only so many lines of air mattresses, there are plenty of mattresses in each line. We’ll go over a couple of different examples of air mattresses by Serta in our Serta air mattress reviews so that you have a better idea of what is actually available to you. Hopefully one of the lines will suit your lifestyle. While air mattresses are extremely convenient, there is nothing more uncomfortable than being close to the ground. You may grow colder extremely quick. You may not have the right amount of comfort in order to sleep. There’s a lot that can be avoided by getting an air mattress is that raised up off the ground. The raised air mattress line by Serta typically contains a built-in air pump that will inflate and deflate your air mattress quickly and efficiently. Some particular air mattresses even come with a pump that will keep your air mattress inflated throughout the night. This line of air mattresses won’t be good for the great outdoors unless you have a generator that you are bringing with you. For some people, this might not be the best fit. 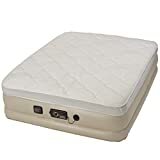 However, for someone that needs an air mattress for guests or for yourself when you are going to someone’s house, this air mattress line will work fantastically. The air mattress line is made to be as supportive and comfortable as a typical air mattress. This makes it a great guest bed for almost any occasion. The different styles mean that you’ll be able to pick the features that matter most to you in this air mattress. So make sure you check around for the right size and style. A Serta EZ bed is something that is really useful. This is the combination of an air mattress and a frame. This kind of air mattress might be better for camping, but you will have to be willing to carry the air mattress with you. This can be a bit burdensome since the air mattress will be a bit heavy. Because it has a frame, this air mattress will be a little bit thinner than the raised air mattresses; however, this does not mean that it’s less comfortable. There are some people that will find this air mattress too thin and uncomfortable. For those people that feel that way, you can get a topper of some sort to use with the air mattress. For the most part, though, the air mattress is enough for a good night’s sleep. In fact, even though there is a frame that folds up, you won’t have to do a ton of work to put it together. This kind of air mattress is put together by simply inflating it. So you will just set the switch on the internal pump and let it go. Having a built-in air pump does mean that you will need to have a place to plug it in, this air mattress can be extremely easy for a guest for a couple days spent out in the woods. As long as you are willing or have access to a plug, this air mattress will be a fantastic product. Twin - 74"x 39", Queen - 80"x60"
Inflated Dimensions: 78" x 60" x 22"
Frame: 64" x 54" x 11.5"
Twin - 74" x 39", Queen - 78" x 60"
Aerobed is a company that specifically works with air mattresses, but that doesn’t necessarily mean that they do better than brands like Serta when it comes to air mattresses. Serta includes built-in pumps in almost all of their air mattresses. This means that you’re going to find it easier to inflate the air mattress than if you have to get out a pump that’s separate. 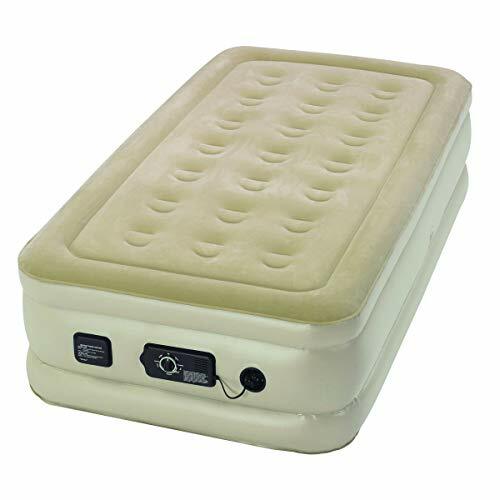 However, some people might prefer to have an air mattress that has a separate pump. Having separate parts does mean that you will be able to decide on different pumps and air mattresses as you go on. Flexibility might be more important to you. When it comes to what you need, you might want to consider the purpose of your air mattress. Going camping might require something that rolls up a little smaller and doesn’t include a pump that requires being plugged in. If you need an air mattress for use inside of your house, then the Serta air mattress lines will be better in general because most of them are built to exist inside of a house. However, if you need an air mattress that is more flexible and can be taken outdoors with ease, then you might want to consider one of the Aerobed lines of air mattresses. While you may not think about an air mattress and memory foam in the same sentence, you should. Adding some memory foam to the air mattress means that you will be getting a little more comfort out of the air mattress than you would otherwise. This is just one of the ways that Serta is putting the knowledge they have of main mattresses first. Memory foam is a great way to make a mattress more comfortable, so it only makes sense that it works with a regular air mattress. However, the foam does mean that you will experience some of the issues that come with the foam. You may feel a little overheated at times during the night because the foam will hold onto the heat a little more than just the plain surface of the air mattress. This may mean you need to adjust the number of sheets and blankets that you put on top of the air mattress, but it shouldn’t make the air mattress too uncomfortable. 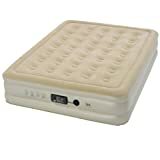 In addition to the issues that you typically face with memory foam, you will have an issue that is specific to the fact that this is an air mattress. While deflating the main part of the air mattress is fairly simple, you may have troubles deflating the portion that has the foam in it. Because of this trouble, you may not be able to get the air mattress folded up as compactly as you would like. Serta focuses on air mattresses that are as close to a normal sleeping experience as possible. If you are looking for a larger range of air mattresses, then you are going to want to look at the air mattresses that Intex has created. There are some higher air mattresses in the lines that Intex offers, but they aren’t made with quite the same things in mind that the Serta air mattresses did. If you are looking for something that’s a little cheaper and that you can take with you to more places and not worry about too much about keeping it pristine, then you will want to look at the different lines of air mattresses that Intex has created. The options that Intex offers means you may be able to find more from one brand that does what you want, but it also means that they are spreading themselves out more. Serta has focused on a specific set of air mattresses. This means that they are trying to tackle the biggest issues that they run into and focus on what it takes to make their air mattress great. In that way, having fewer lines, but with more options within those lines makes Serta better for getting air mattresses that you use in your home. The lower price of Intex air mattresses also means that they might not last quite as long as the Serta air mattresses. What you need will depend on what you need the air mattress to do. In some ways, the Intex air mattresses are better than the Serta air mattresses, but the Serta air mattresses are better in different ways that the Intex. You’ll have to decide what matters most before you make any choices when it comes to purchasing air mattresses from either company. Knowing the warranty on your air mattress is important. It will help you understand what you can get if you are having an issue with the air mattress. The warranty will depend on several different things. There is the warranty that you have with the actual company and sometimes a policy that comes through the person that you bought it through. This is especially true when you’re buying things online. Getting an air mattress off the internet may feel a little bit tricky. However, Amazon and other retailers often offer a return period. Usually, the period is 30 days and not a lot more. This can work for many items. However, an air mattress might not be used within the first month of being purchased. Or if it is used, it might not be used for another couple of months. Because of this, you will want to double check the warranty that is offered by the company. In Serta’s case, there is a 1-year warranty on the air mattress. This is good for dealing with issues that come up that are not caused by you. However, you will not be able to use the warranty when your air mattress breaks down from normal wear and tear. The warranty is meant to be used because there is a flaw in the construction of the air mattress. So if the air mattress had a non-functioning pump and you hadn’t used the air mattress, then you would be able to return it through either the manufacturer or Amazon depending on when you actually opened the air mattress. A return policy is different than the warranty. The manufacturer will either include a free limited warranty or even offer a warranty that you pay a little bit for with the purchase of the product. Having a warranty is a way that the company makes sure that you are happy with the purchase that you have made as well as making sure that they are protected in case something fails. With a return policy, you will be much more limited as a consumer. The return policy will probably only be for a month. With some items, it could be less, but that’s the average amount of time that you will have on websites like Amazon. With the return policy, you may also be limited in how you get the product back to the supplier. Often, Amazon will provide you with a label when you want to return a product, but that isn’t true for every website that you might purchase a Serta air mattress. You may not be able to return the air mattress if you have used it or worn it out, which is one of the reasons why there is such a short time period. If your air mattress arrived with a defect, then you won’t want to even finish unboxing the product. As soon as you notice the error, you should send it back. By sending it back quickly, you are more likely to be able to get the money back or a replacement sent to you. You will need to call them before you send the air mattress back in case there is something that you need to include in the box. Once you have everything lined up with the company, then you should send the air mattress back. You may have to wait a while to hear back, depending on the situation. However, returns are typically painless. Here are some quick reviews of the top Serta Air Mattresses. This air mattress doesn’t just have one built-in bump but two. The purpose of two pumps is to allow you to inflate the air mattress when you need it and to keep the air mattress full throughout the night. You might think that having a pump to make sure that the air mattress is always full is a bit weird. However, air mattresses stretch and even the best air mattress might have a little bit of air leak from the valve of the air mattress. The never flat pump ensures that the air mattress is at the right firmness as well. The pump in this particular model will allow you to pick the firmness. Changing the firmness of your air mattress is about making sure that you are getting the most comfortable night of sleep possible, so it’s nice that the option is included. This will mean that you need to have an outlet to plug your air mattress into. Even with all the options to try and make this air mattress more comfortable, you might find that this air mattress is just a little too for you. However, I’m certain that this air mattress will be able to at least give you a comfortable and more normal place to sleep because of the raised height of the air mattress. This version of the Serta raised air mattress s a little bit simpler than some of the others, but that doesn’t mean that the air mattress isn’t as good as all the other air mattresses out there. The biggest difference is that this air mattress doesn’t have a never flat pump. While the never flat pump is a nice addition, some people don’t need the extra pump there. 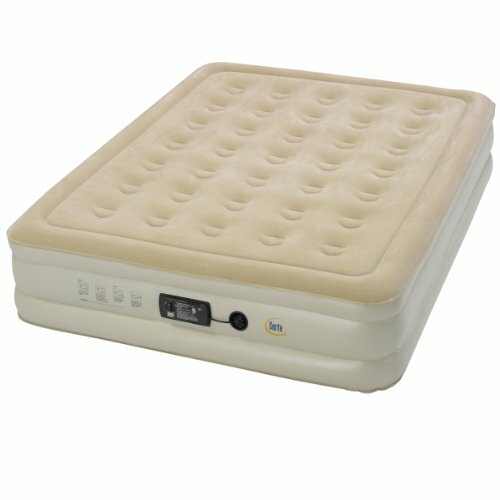 Without the secondary pump, this air mattress is also a little bit cheaper. Another way that this air mattress is made just a little more affordable is a little shorter than other raised air mattresses at 15 inches. However, that’s still a good amount of height for people that want a raised air mattress. The pump requires an outlet to plug into, but the pump works quickly to both inflate and deflate the air mattress with a twist of the dial. You can’t adjust the firmness of this air mattress except by shutting off the pump a little bit earlier than you want. Although the pump isn’t as sophisticated as on other air mattresses by Serta, the air mattress is quite comfortable and serves many different kinds of sleepers well. You’ll be able to get quite a nice night of sleep on this air mattress. This air mattress combines so many great qualities that almost anyone will want this in their home. 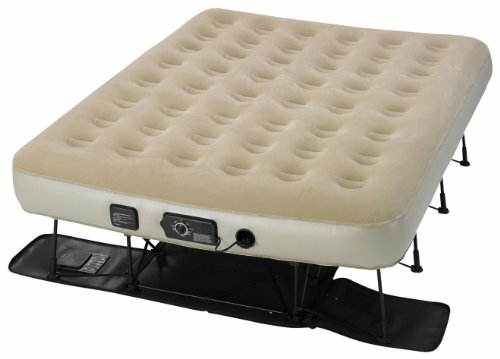 The air mattress has a never flat pump along with the pump that inflates and deflates the air mattress itself. The top of the air mattress has a nice cover that will make the air mattress more comfortable and useful. This air mattress will be great for any guests that come over. You won’t have to fuss with finding the air pump since it will be built into the air mattress. And your guests won’t have to worry about figuring out how the air mattress works as the never flat pump will do all of the work for them in case the air mattress deflates a little during the night. This air mattress is one of the taller ones that Serta makes. Having a taller mattress can be easier on those that are older or have health issues as they won’t have to fall into the bed and have to struggle to get standing again. Because of the fact that you can adjust the firmness, this air mattress is great when you know that the people staying over are particular about how their mattresses feel. You’ll be more comfortable with the situation as long as you have this air mattress waiting. However, like other air mattresses, this one will break down eventually. You will have to make sure that you are treating the air mattress well if you don’t want to have to worry about it breaking down immediately. This air mattress is a definite departure from the rest of the air mattresses that have been featured in the other Serta air mattress reviews. The reason why this one is so different is that it has a frame. This does elevate the air mattress even higher than the other air mattresses that are made by Serta. This air mattress might also be good a choice for those that are camping somewhere for multiple days. You might need to include a generator of some sort to get the mattress set up for the night, but it might be worth it to get a more comfortable night of sleep. This air mattress doesn’t require a ton of setup either since simply inflating it will get the frame in the right place. You might have to supervise and make sure that everything is working correctly, but this air mattress will do quite a bit of the work for you. That is great news for people that don’t want to have to directly supervise or help the process of inflation every time. Because there is a frame that is helping make the air mattress taller, the actual air mattress is a little bit thinner. This might be a problem for some people, but a common solution is to buy a mattress topper for the mattress. Getting a good air mattress is incredibly important if you want to make sure that you or your guests are getting a good night’s sleep. Serta’s air mattresses are built to be the same quality as the actual mattresses that are made by the same brand. Getting an air mattress from someone that really knows sleep means that you’re going to get a lot out of the experience. Serta’s options are better than some air mattresses out there, but they also won’t be able to go to many other places as they need to be plugged into work. However, if you’re okay with using the air mattress more indoors than anything else, then these air mattresses can be a great choice. We gave you an overview of the lines that they have as well as some specific Serta air mattress reviews to help you pick out the best air mattress from Serta for your lifestyle. Our team consists of enthusiastic and passionate people from different fields and experience. Some are geeks and spend most of their time among gadgets while others love nature and are always on the move! We spend 10s of hours researching and writing on each topic. The articles are then quality checked by our editors. View our "About us" section for more details about process and team. DuroStar DS4400 Detail Review – Specs., Warranty, Comparisons & more. Best Air Mattress For Guests : Sofa Sleeper, Folding Cot & more.